WELCOME TO GREAT SEDONA HIKES! Hello and welcome to Great Sedona Hikes! Here you'll find free information on hiking in Sedona, Arizona. The website will help you make the most efficient use of your time in Sedona by assisting you in hike selection, general locations of the trailhead parking areas and information on the requirements for parking on the Coconino National Forest around Sedona. But you don't need to be a hiker to enjoy the site. It has lots of information about Sedona and many beautiful photographs taken while hiking the Sedona trails. The photo above was taken on a hike on the Coffeepot Trail. This in-town hike provides some wonderful red rock views. Sedona is a very special place - the red rocks, the mountains and surrounding canyons are beautiful and I've tried to capture their beauty with the photos and descriptions included on the website. I started hiking in Sedona over 13 years ago and since then have hiked over 2200 miles on most of the Sedona hiking trails. I'm happy to share my hiking experiences on the website. The website was launched in 2005 to share the hiking photos taken by members of our hiking group. Since then, it's been expanded in scope so it now, in addition to the hike photos, provides Sedona visitors with broad information on the hikes and information on where to stay, shop and eat while in Sedona. You are going to have a wonderful time while visiting Sedona! The close proximity of the hiking trails and the existence of Sedona's vortexes make hiking among the red rocks an experience you won't forget. It is very important to have up-to-date information on the hiking trails so that you save time, choose the right trail and don't become lost. You should consider our Great Sedona Hikes Revised 5th Edition hiking guide to help you find that perfect trail. We published Great Sedona Hikes Revised 5th Edition in April 2018. We keep it updated (updates were incorporated in January 2019). It's available here. 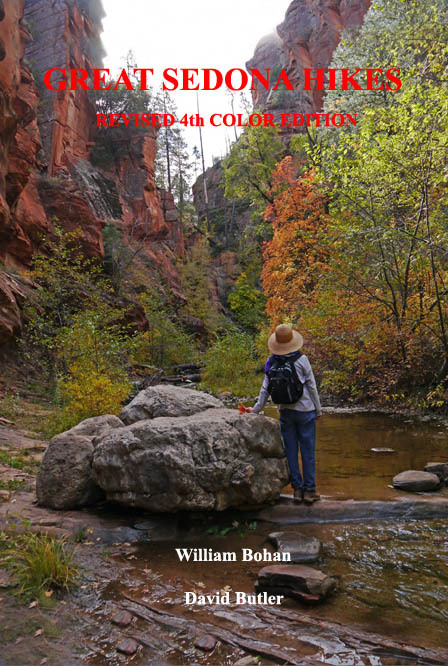 Our color edition of Great Sedona Hikes was released in March 2016 (updates incorporated in May 2018). It's available here. Or perhaps you should consider our Hiking the Vortexes guide to help you find where Sedona's vortexes are located. Hiking the Vortexes is available here. All of our guides are designed to help make your Sedona hiking and vortex experience as efficient and pleasurable as possible. You won't waste time trying to find the parking areas or trailheads - our directions will take you there without getting lost. 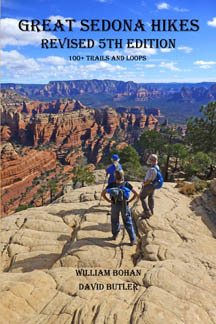 Click here and you'll find information on our vortex guides, GPS data files and our latest hiking guides -- Great Sedona Hikes Revised 5th Edition and Great Sedona Hikes Revised 4th Color Edition. OK, enough of the sales pitch. Let's go for a hike! But before you go hiking, you should obtain a copy of an up-to-date hiking guide (preferably Great Sedona Hikes) or stop in at the Red Rock Ranger Station Visitor Center located at 8375 State Route 179, the new Sedona Village Visitor Center located at 7000 State Route 179 in the Collective Shopping Center, or the Sedona-Oak Creek Canyon Chamber of Commerce Visitor Center located at the corner of State Route 89A and Forest Road. You'll need a Red Rock Pass or equivalent to park at many trailheads on the National Forest for your hike. Click here if you'd like to see where Recreation Passes (i.e. Red Rock Passes) are now required and where there are some special fee areas (note: this is a 3.3 MB file so it may take a few moments to download). Sedona gets very busy on the weekends and the trailhead parking areas can fill up. Here's a thought: you can use a Uber or Lyft ride to take you to the trailhead, then call for a pickup when you've completed your hike. The Forest Service and our hiking group cannot stress enough that you be prepared before you begin hiking, even for a short day hike. The humidity is very low here and you need to take plenty of water to avoid dehydration, particularly in the summer. An up-to-date hiking guide, sunscreen, a hat, compass, maps or a portable GPS, a charged cell phone (although many trails do not have cell phone coverage) and good hiking boots are among the recommended items you should have with you. And you need to let someone know where you are hiking and when they should expect you back. The weather conditions can play a major role in your hike, so here's a link to the local Sedona weather forecast for the next week. Finally, be sure you stay on the trail and are off the trail by sunset because hiking back in the darkness will likely get you lost, perhaps injured and in need of rescue. Here are some stories of what can happen to hikers who leave the trail. A special note about Forest Road (FR) 152 and Schnebly Hill Road. To access the Devil's Bridge Trail (but see the Long Canyon Road alternative), west end of Brins Mesa, Secret Canyon, HS Canyon, Dry Creek, Bear Sign and Vultee Arch trails, you'll need to drive out FR 152. To get to Cow Pies, you need to drive out Schnebly Hill Road. Both of these unmaintained dirt and rock roads require a high clearance vehicle (4-wheel drive recommended). Watch the video of a drive on FR 152 as an example of what you can expect. And Schnebly Hill Road is just as bad. Bottom line: Do not attempt FR 152 or Schnebly Hill Road if you don't have a high clearance vehicle and even then, be careful! I've tried to keep the website simple - to focus on the hiking information rather than have a lot of fancy graphics. The hikes are organized by level of difficulty (EASY, MODERATE, and HARD HIKES ), based on ratings determined in our hiking guide, "Great Sedona Hikes Revised 5th Edition" and assessment by our hiking group. If you are unsure what level of hike you are capable of, start out with the EASY hikes until you are sure you are up for something more demanding. NOTE: The summary information on the hikes is to help with hike selection and is not intended to be used for hiking the trail. For your safety and enjoyment, please obtain a copy of Great Sedona Hikes Revised 5th Edition hiking guide available here. An ALPHABETICAL LIST of all the hikes on the website is here. A list of hikes by distance/level of difficulty is here. Vortex hikes are listed here (as well as a brief history and explanation of vortexes). Hikes near/along water are listed here. Hikes to/near Indian Ruins are listed here. GPS data files for the hikes are found here. Information on mountain biking is included here. The site also includes interesting and informative pictures of the Sedona area and beyond, courtesy of members of the hiking group. If you have questions about Sedona go to Sedona FAQs for more detailed information on the weather, location, what to do (besides hiking), etc. in Sedona. If you like what you find on the website and would like to make a donation to help maintain the website please click the "Donate" button below. Any amount is greatly appreciated. New information is constantly being added and updated. So check back often. If you have comments, suggestions or photos you think might be candidates for the website, or you are in Sedona and would like to join us for a hike, please email me. Welcome to Sedona and enjoy your visit to the website! Disclaimer: This web site is intended to show some of the beauty of the hiking trails around Sedona, Arizona USA and is not intended to be used as an authoritative hiking guide. Road and trail conditions can and do change, and you are strongly encouraged to get up-to-date hiking information before you set out; our hiking guide, Great Sedona Hikes Revised 4th Edition, the Sedona Chamber of Commerce Visitor's Center in uptown Sedona and the Forest Service Ranger Station located on State Route 179 are excellent sources of information. Hikers are responsible for their own safety (see before you go). The contributors to "Great Sedona Hikes," and everyone associated with it directly or indirectly, disclaim any liability for damages, losses, or injuries that might occur to those using this website.